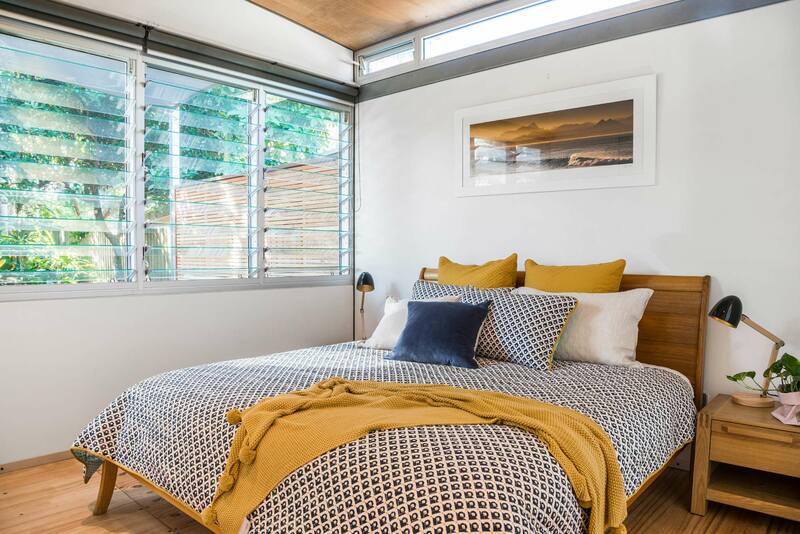 When you enter BillaBelongil, you’ll discover a modern holiday home, just a few steps from the perfect white sands of Belongil Beach in Byron Bay. 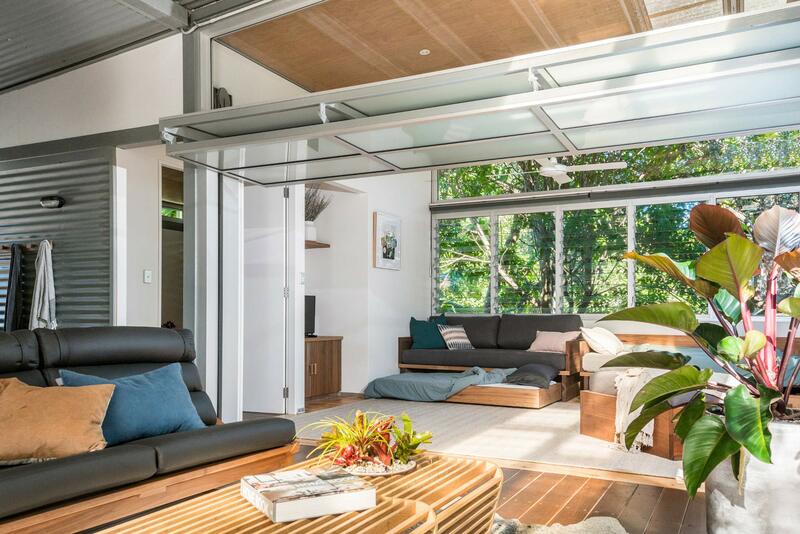 The contemporary, industrial design incorporates floor-to-ceiling windows which fold open, creating a breezy, indoor/outdoor great room, ideal for relaxing and entertaining friends or family. Spacious and filled with natural light, BillaBelongil has two bathrooms and three bedrooms; one designed for up to four children with two lounge beds with trundles. The well-appointed kitchen has sleek, stainless steel countertops and appliances, with a centre island and breakfast bar. Step out into the beautifully landscaped garden and feel the gentle, sea breeze. 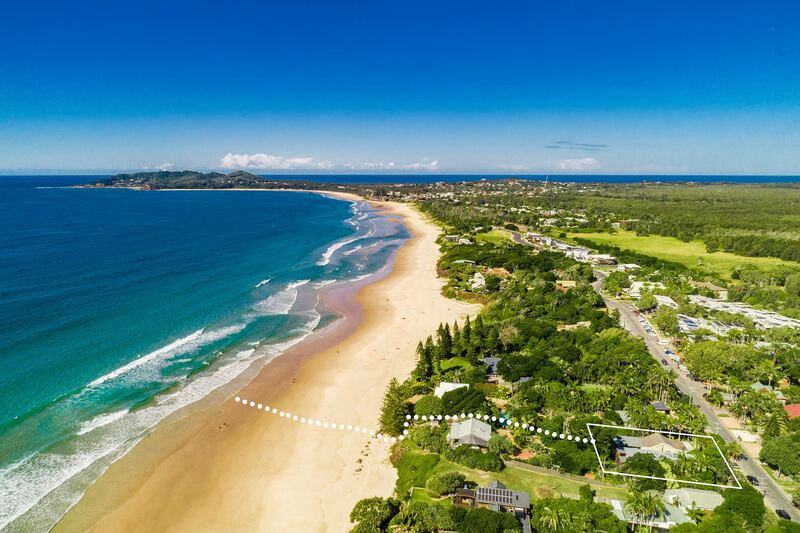 It’s just a short, 50-metre walk down a private track to pristine Belongil Beach, where you can swim, play, and surf to your heart’s content. More experienced surfers will love the powerful right-hand break at the beach’s eastern end. 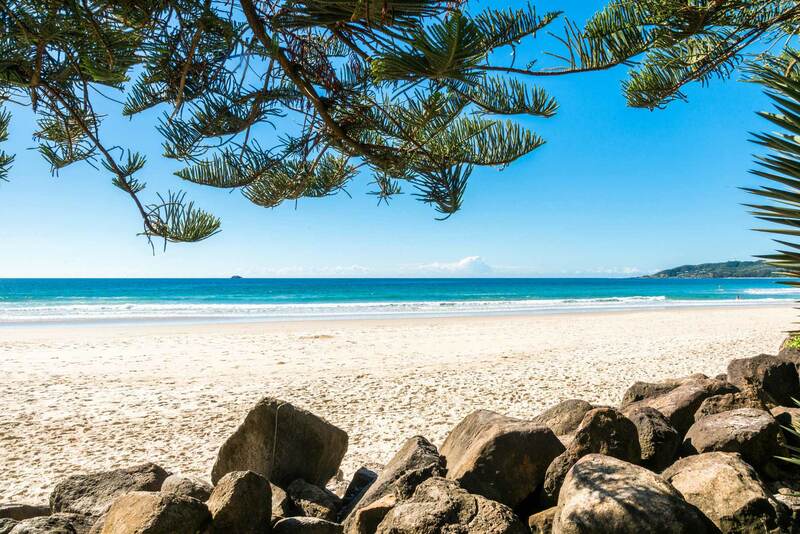 Byron Bay’s shopping, art, and vibrant dining scene await! Skip the 5-minute drive in favour of strolling southeast along the beach and arrive in town in no time. 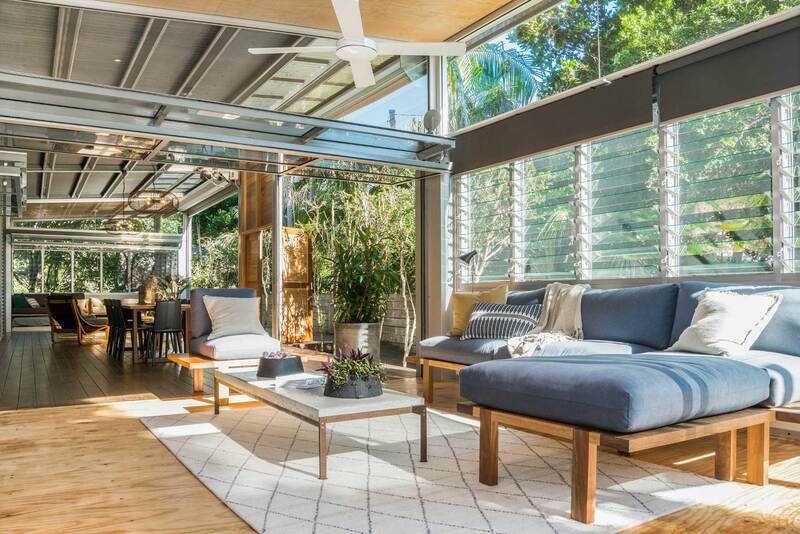 The heart of this home is certainly the spacious, airy great room, divided by flexible partitions which easily fold up to open the space, creating a large, indoor/outdoor living and dining area. 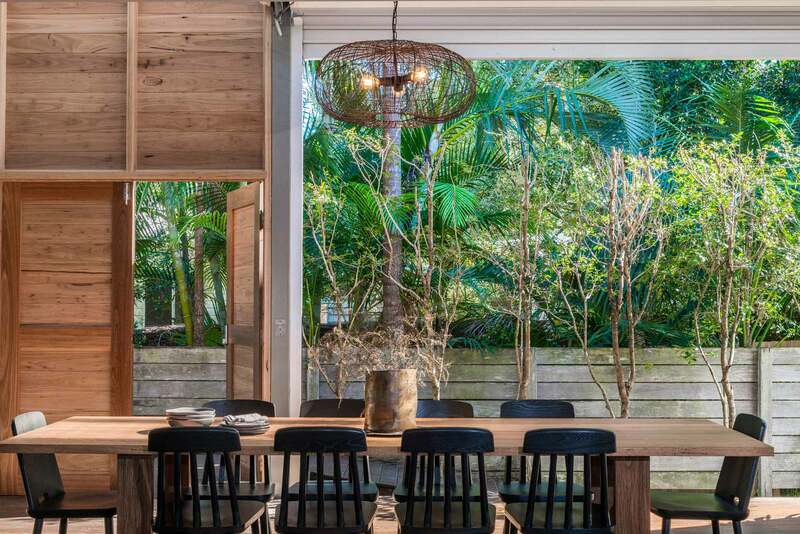 This space is flooded with natural light, thanks to floor-to-ceiling windows, which frame lush landscaping. 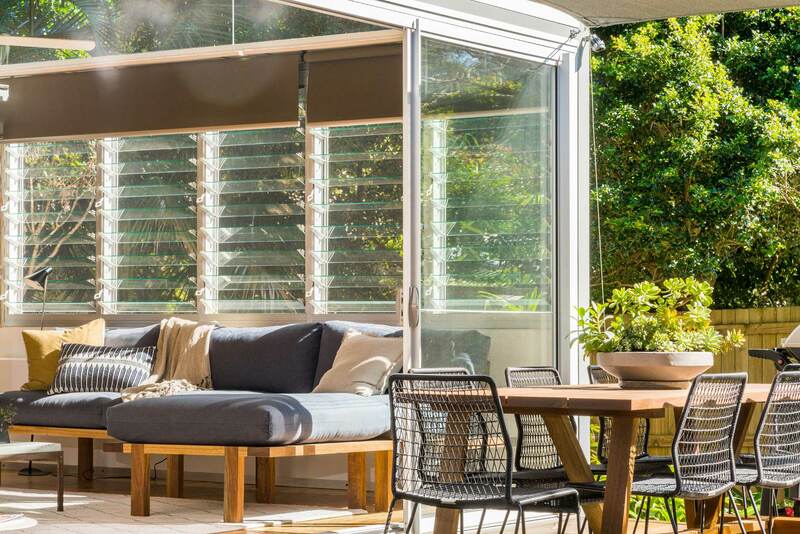 Curl up with a good book on plush, comfy couches inside or soak up the sun outside on the deck. There’s seating for 10 at the custom, indoor dining table, and 8 outside on the deck. In the kitchen, a breakfast bar for 3 is the perfect spot for your morning coffee. 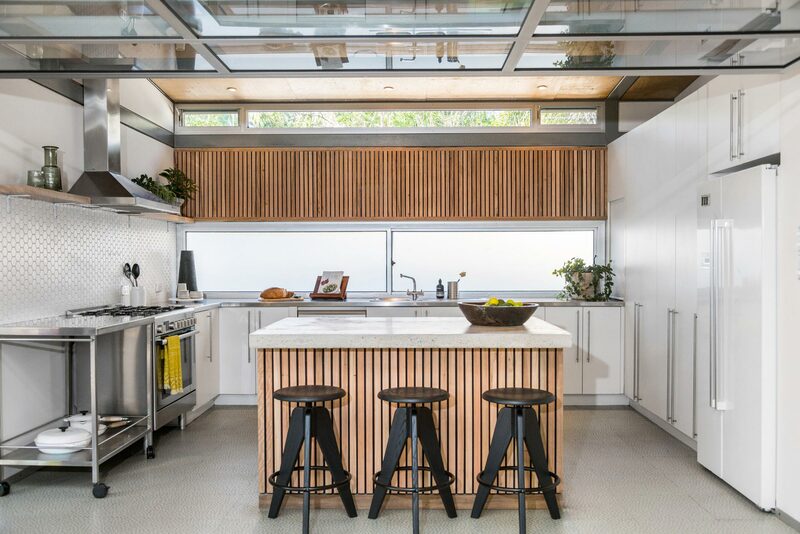 BillaBelongil’s modern kitchen boasts high-end, stainless steel appliances as well as a sleek, stainless steel countertop and kitchen island with breakfast bar seating for three. This fully-equipped kitchen contains a gas stove top oven and range, as well as a DeLonghi Nespresso machine, with coffee pods provided. Natural wood beadboard accents and a tiled backsplash offer added style and function. 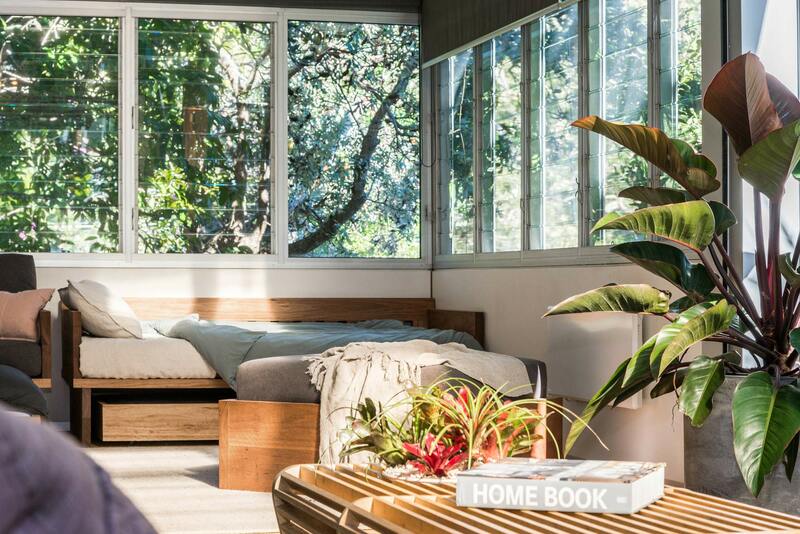 This holiday home features 3 smartly-appointed bedrooms, one doubling as a media room, with high ceilings and contemporary décor in warm, earthy tones. 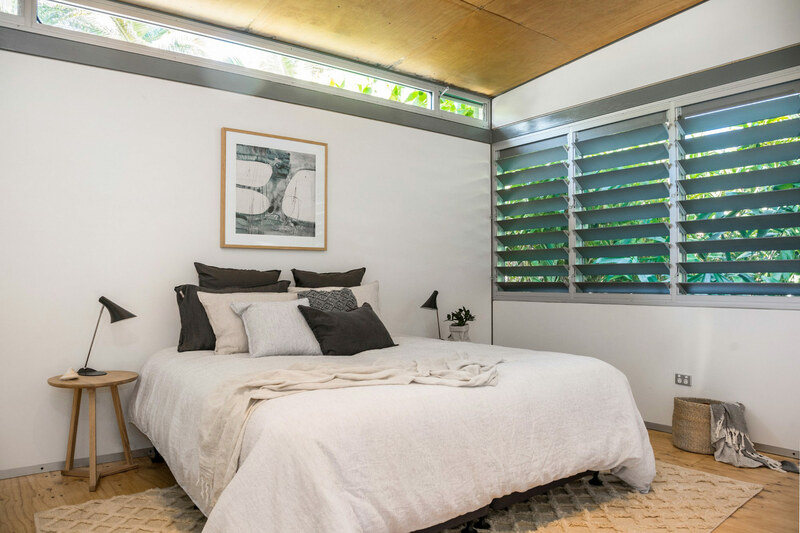 With a large window overlooking the lush garden, the master bedroom offers a king-size bed and stylish, tiled ensuite bathroom with shower. The second bedroom has a king-sized bed which can be converted into two single beds. With its own flat screen TV, the third bedroom also doubles as a combined kids room and media room, where the whole family can lounge comfortably and enjoy time together. By night, the two lounge beds each have an extra trundle below that can be rolled out, suitable for sleeping up to four children, only. Crisp, white subway tiles and sleek, wooden shelving adorn the stylish ensuite with shower, just off the master bedroom. 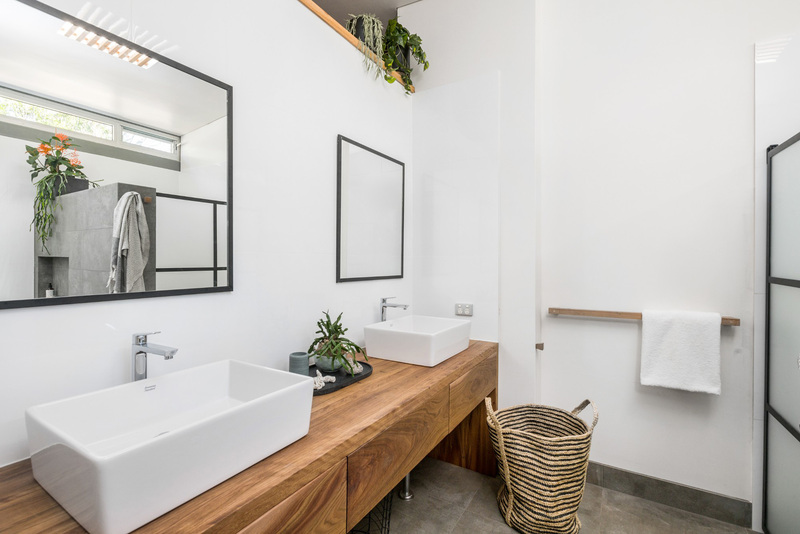 A spacious second bathroom comes equipped with a large, double vanity with two roomy vessel sinks, along with plenty of counter and drawer space. The beautiful, tiled floors continue upwards, lining two separate shower stalls, each with a modern overhead fixture and recessed shelf for your favourite gels and soaps. 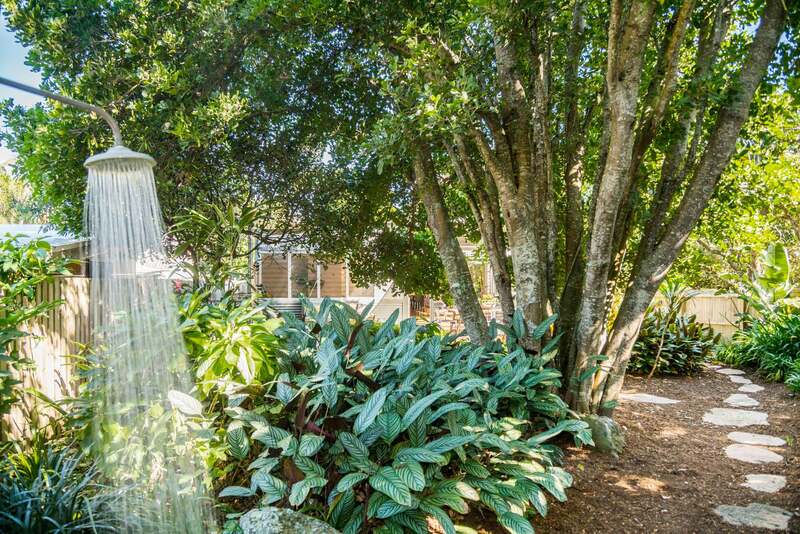 In the garden, an outdoor, overhead shower is perfect for rinsing off after a refreshing dip in the ocean. 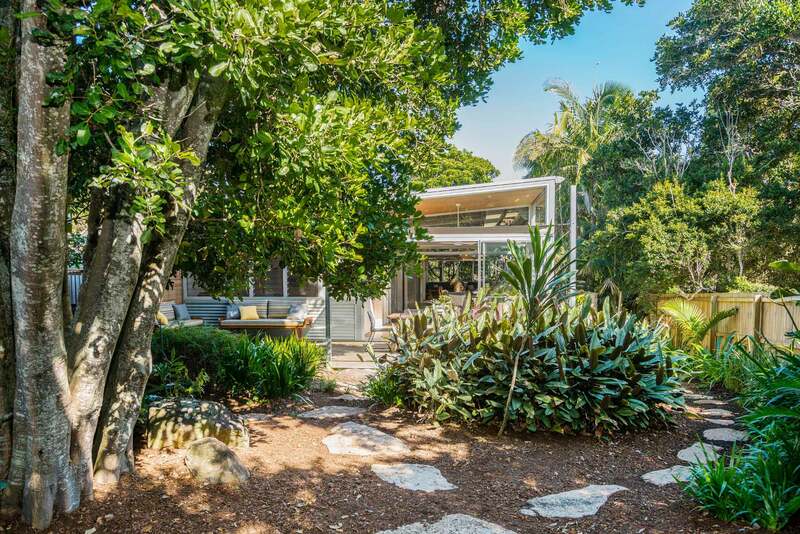 Leafy palms and large trees provide pleasant shade and refreshing greenery all around the house, particularly in the charming back garden. Admire the lush landscaping and feel the salty sea breeze from the partially covered outdoor deck, with comfy lounge area and 8-seater dining table. 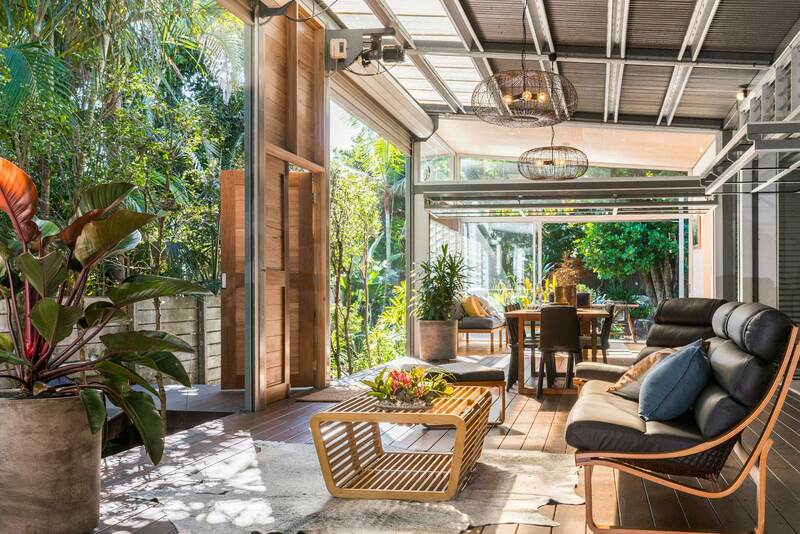 In the living and dining area, hinged glass windows fold up like garage doors to create an open-air, indoor/outdoor great room. Ceiling fans circulate the gentle sea breeze while fans are also provided in each bedroom. There is space for 2 cars to park in the driveway. BillaBelongil is located on leafy Childe Street, just a short walk (50 metres) from the pristine, white sands of Belongil Beach. 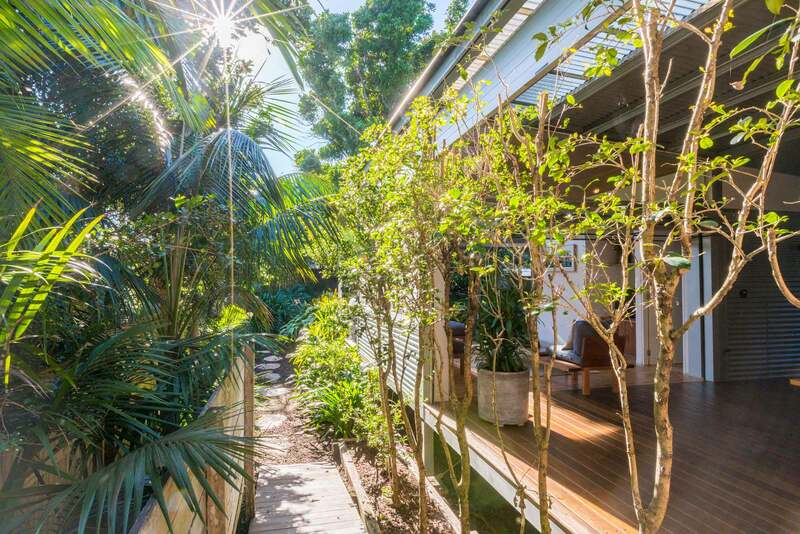 Stylish local boutiques and renowned dining are just a 5-minute drive away in Byron Bay. Better yet, take a picturesque stroll along the beach and reach the town in just 10-15 minutes. Head to town on Thursdays for the Byron Farmers Market, then join the locals at Main Beach for a spectacular sunset. 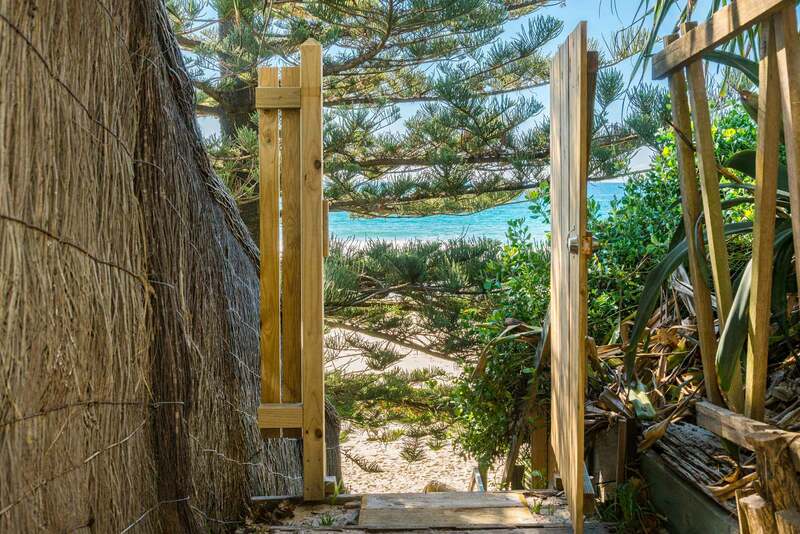 Group restrictions - maximum of 4 adults at the property unless otherwise approved directly with A Perfect Stay/Byron Bay Holiday Rentals. 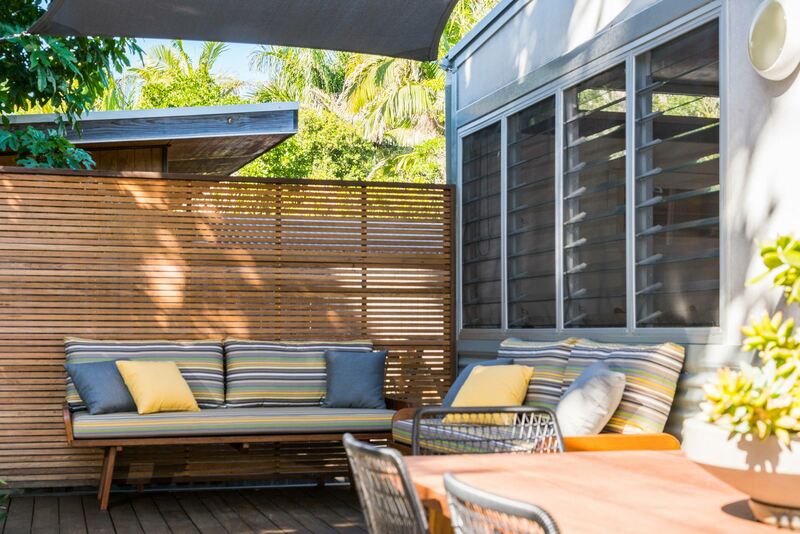 Intimate events, photo/video shoots may be arranged directly with A Perfect Stay (includes Byron Bay Holiday Rentals). Additional fees and T&C’s apply. ​No smoking inside the property. We loved the industrial feel of the property and the way it could be opened up to increase airflow and bring the outside in. I was very impressed with the speed with which the A Perfect Stay team swung into action when I called to get the 'garage door' wall fixed. The person who came to fix it was excellent too, and sorted a couple of other things whilst there (broken toilet seat/spent lightbulb). It was great to have dishwasher tablets and detergent provided so that we could walk straight in and get started without needing to go to the supermarket for these kind of staples. I absolutely LOVED our stay in Belongil and the house was perfect! Eating dinner at the long table at the house with close friends was so wonderful. Thank you so much!!! A wonderful property which definitely met our expectations. Very creative home and fantastic location. We'll sure be recommending it to friends, and we made some great memories in our time there. Thanks!